When Edrington, the international spirits group that owns The Macallan, decided to build a £140 million facility to meet increasing global demand, they knew that no ordinary site would suffice. Instead, Edrington worked with the architectural practise Rogers Stirk Harbour + Partners to build a one-of-a-kind architectural monument on The Macallan’s traditional Speyside estate to house both a distillery and visitor centre. The development consists of five cells that seamlessly blend into the surrounding countryside as undulating, green-roofed earthworks. Four of these would house the brand’s production operations (three still houses and a mash house) and one would be the visitor centre. Not only would the new distillery merge The Macallan’s centuries old traditions with cutting-edge thinking, but it would do so in a way that allows visitors to see each step of the process while surrounded in a sustainable and luxurious environment. This meant creating a facility that would not only meet all the challenging industrial concerns inherent to making some of the world’s best whisky, but to do so while constantly conveying an inviting, on-brand aesthetic. This was a particular challenge for the floor area in the four production cells that house the copper stills, mash tuns, stainless steel washbacks, distillation and fermentation vessels, pipes and assorted distillery apparatus. The flooring in these areas will likely face spillages of hot, corrosive by-products alongside point loading from heavy equipment, frequent foot traffic, intensive cleaning, impacts and more. George McKenzie, Edrington’s UK Engineering Manager George McKenzie says the company looks on Macallan as a world luxury brand, and so the whole feeling, the whole aesthetics, including the floor coverings, had to match that. To ensure that the surface would maintain a functional, visually attractive finish, 5,570 m2 of the polyurethane system Flowfresh HF LT was applied. This robust, chemical resistant system would be able to withstand the onsite conditions and provide additional benefits such as easy cleanability, slip resistance and an in-built antibacterial agent. A sleek grey colour was chosen to match the production area’s industrial aesthetic. The application of the Flowfresh HF LT around the intricate pipework was tricky, but thanks to the easy applicability of the system, the floor was completed on schedule and to The Macallan’s exacting standards. “During the commissioning of the process area, we’ve had some spillages of alcohol, malt, malt dust, caustic, which are all pretty hard on the floor coverings and the floors are still pristine,” McKenzie adds. Visitors to The Macallan’s whisky tour would not just experience Flowcrete flooring in the production areas, as its screeds and decorative finishes were also applied across many other parts of the site’s visitor centre and distillery tour. Before the resin finishes could be applied, 3,669 m2 of Isocrete K-Screed and 4,890 m2 of Flowscreed Industrial Top were used to create robust screed layers that would provide level and reliable platforms for the decorative coatings. The main internal tourist routes and viewing gallery were then coated with the fast curing, methyl methacrylate (MMA) resin floor topping Flowfast Quartz Structure. This system combines decorative colour stable quartz granules in a clear resin binder to create a durable floor with an attractive, textured finish. A stony, dark grey shade was chosen to match the natural tones and hues of the site. This choice was also a great way to use the floor as a backdrop on which the colours of the timber roof, copper stills, wooden barrels and golden whisky bottles could pop and stand out. The grey Flowfast Quartz Structure finish was even applied on the innovative suspended walkway that runs across the top of the distillery’s large tanks. Areas that are usually just functional spaces have been reimagined into visually stunning works of art in The Macallan’s new facility. This is especially true of the barrel room (or cave privee), where the sherry cask maturation of the distilled spirit takes place. This has been turned into a private cellar that displays each cask like a gallery exhibition, putting the visitor in the centre of a semi-circle of back-lit barrels. 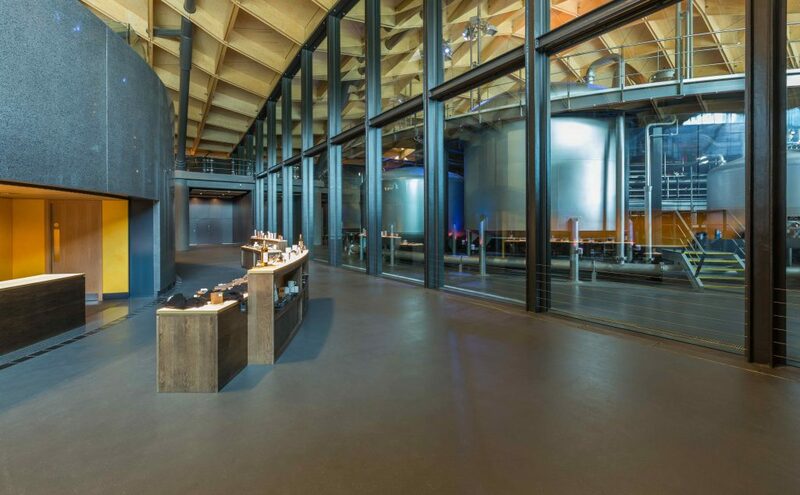 Some 303 m2 of the self-smoothing epoxy system Peran SL in a glossy black finish was applied to create a sleek floor that would reflect the cellar’s lights and the outlines of the barrels above in a dynamic, eye-catching manner. 745 m2 of Isocrete Isopol SBR was installed in this area to produce a reliable and durable polymer modified wearing screed for the Peran SL coating to bond to. Toby Jeavons, Project Architect and Associate Partner at Rogers Stirk Harbour + Partners, says his acts as a centre piece exhibit and the ‘holy of holies’ for visitors and fans on the Macallan pilgrimage. “The design required that both the ceiling and floor of this space be black in colour and highly reflective so providing the illusion of an endless array of vertical casks. The bonded gravel system Naturewalk was utilised for the distillery’s external perimeter walkway. Naturewalk is a seamless, slip resistant coating designed to reflect the natural beauty of the outdoors. This combination of properties was ideal, as it would tie into the venue’s aesthetics and ensure a safe finish able to survive heavy foot traffic and the inclement Scottish weather.